The Australasian Fire and Emergency Service Authorities Council Limited (AFAC) have produced a publicly accessible visual mapping tool based on research methodologies designed by Professor Ruth Beilin and Dr Karen Reid from the Landscape and Environmental Sociology research group, School of Ecosystem and Forest Sciences. 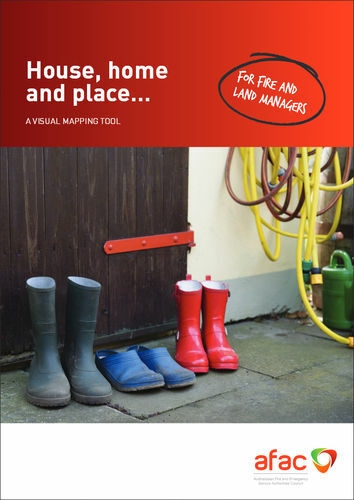 ‘House, Home and Place: A visual mapping tool for fire and land Managers’ is a social research tool that can be used across the nation to engage communities in rethinking their fire response and understanding fire risk in their local landscapes. It features the methods developed by Professor Beilin and Dr Reid in their research project ‘Social Construct of Fuels in the Interface (The Social Construction of Landscape)’, a Bushfire Cooperative Research Centre funded project. The Landscape and Environmental Sociology group researches in the area associated with the construction of social ecological knowledge. For example recent research projects have included applied and theoretical studies encompassing: disaster risk in the landscape, placed-based communities, scientific knowledge in government agencies associated with natural resource management and socio-ecological systems, the socio-economic drivers of rural land use change, bushfire practices, climate change risk communication, policy and social [mal]adaptation to drought, fire, flood, sea rise and other issues affecting social ecological resilience.